It can be hard to find a Ventura dentist that can provide all of your family and cosmetic dental procedures under one roof. At Mark Weitzman D.D.S., however, we are your one-stop shop for all of your dental needs! Because we are considered one of the leading dental offices in Ventura, we are your one-stop shop for all of your family and cosmetic dental needs. Take a moment to learn more about our world-class services, which we have described below for your convenience. Brighten Your Smile with Help from Mark Weitzman D.D.S. At Mark Weitzman D.D.S., we treat our patients with the highest degree of care and professionalism, catering to nearly every cosmetic dental need. With more than 15 years of experience creating some of the industry's most notable smiles, our Ventura dentist can be trusted to help you achieve your greatest cosmetic dental goals! Porcelain crowns and inlays can be molded and sculpted to replicate the look of natural tooth enamel while protecting the teeth and improving the patient's overall oral health. Our dentist can implant full porcelain crowns and inlays that look natural and restore your smile quickly. When plaque and other minerals continue to build on the surfaces of teeth, inflammation and infection can lead to serious decay and disease. Unlike routine dental cleaning, deep cleaning procedures are designed to help patients avoid dental diseases such as periodontal disease or gingivitis. 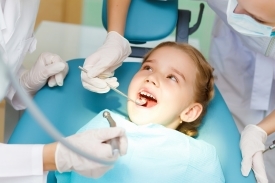 Our dentists can perform routine cleaning and deep cleaning procedures. If you need to replace one or more teeth, our professional dentists can provide dental implant procedures. A dental implant can be a great option to improve your smile. During the procedure, an artificial tooth is implanted into the jaw to replace missing, broken, or chipped teeth or dentures. Our dentists use the safest, most advanced procedures and materials to make your dental experience as painless as possible. From mercury-free fillings to ceramic finishes, we want to ensure that our final product exceeds your expectations. We offer a range of services for your family, including routine checkups, dental cleanings, oral surgeries, or cosmetic procedures. Some dentures can be partially removable but can create difficult problems down the line. Our implant-assisted dentures may be another option for you to directly replace teeth without the hassle of removable dentures. Our professional team can determine whether a denture implant is a viable option to help you restore your oral health. When a nerve - or the root - within a tooth becomes inflamed or infected, an individual may need to undergo a root canal procedure. Although many patients fear this particular oral surgery, our skilled technicians make every effort to make your dental procedure comfortable and painless. Teeth grinding occurs in adults and children. In adults, it usually occurs at night as they sleep and it is often caused by stress, anxiety, or misaligned teeth. If left untreated, continuous teeth grinding in adults can cause headaches, jaw pain, tooth fractures, and loose teeth. We can fit you with a mouth guard that can help protect your teeth as you sleep. Mark Weitzman D.D.S. has a reputation for excellence, and we are an exceptional choice for your dental needs. Dr. Weitzman is a master ceramist. Our patients can receive much more satisfactory results with a more natural-looking finish by working with Dr. Weitzman. To learn more, we invite you to read our Dentistry FAQ page. We won't put our name on the final product until our patient is 100% satisfied with our work and until we are 100% satisfied as well. On top of this, we are honest in our pricing, so you can get all of your cosmetic and family dental work done under one roof at a competitive rate! Contact Mark Weitzman D.D.S. to schedule your appointment with our professional Ventura dentist today!